From their humble beginnings as a middle-of-the-road indie rock band, Swiss trio Sinner DC, formed of Steve Mamey, Julien Amey, and Manuel Bravo, have retained virtually nothing, ditching it all for the much more elegant and nuanced Krautrock-infused sound which first began to take shape on their 2005 Arkle Sparkle Avenue album (Tritone), but really only truly developed on its follow up, the lush and rich Mount Age, the band’s first foray on London-based Ai Records, in 2006. Almost three years on, the trio are back in action with their sixth album, their second for Ai. More than a progression, Crystallized denotes a reinforcement of the themes developed on Mount Age, both sonically and aesthetically. While Arkle Sparkle Avenue was still relying occasionally on pop/rock forms, the trio turned to more polished soundscapes for Mount Age, weaving splendid warm textural drapes and throwing them over linear beats to create dense ethereal pop songs. On Crystallized, Mamey, Amey and Bravo apply a very similar template, to similar effect. At times, the sound is more forceful, as on the thumping Golden Horses, but by and large, the album operates between the softly shaded tones of Go For The Stream, Sunrized, Glass Alley or Coast, and the heady peaks of Anyway or The Medium Is The Message, without veering much outside of these. Only the ominous and claustrophobic V draws this opus on the brink of darker experiment. Despite its exquisite attires and highly polished surfaces, Crystallized lacks the sparkle that gave its predecessor its eerie charm. Melodies are refined and efficient enough, but they all too often fail to stick, leaving Manuel Bravo’s ghostly vocals, often almost totally drowned in the mix, to fight for something to hang on to, a fate also met by some of the instrumental compositions. Remains the stunning soundscapes, where treated guitars, pulsating bass lines and warm analogue electronics are so tightly intertwined that it is totally impossible to disassociate them, coating each song in a thick cloak of sounds and giving the whole album a seamless flow. 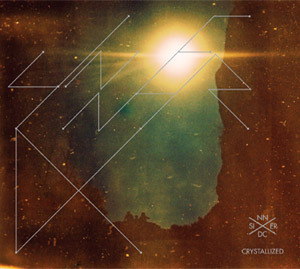 With Crystallized, Sinner DC have produced a highly sophisticated and elegant record, which, while lacking the sheer pop genius of its predecessor, still manages to showcase the band’s sound in all its luxurious glory and remain a truly enjoyable, if sometimes a tad too forgettable, record.